Beautiful 4 Bedroom, 3 Bath, Mediterranean style home in a CUL-DE-SAC. Spacious interior layout with lots of natural light. 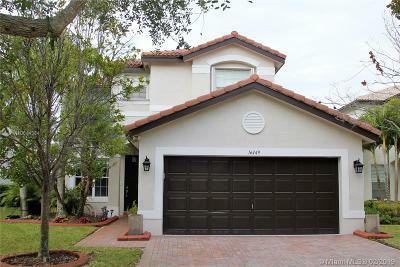 Located in the heart of Miramar in the highly desirable gated community of Silver Isles!!! This property has been highly cared for with pride by the owners who have paid attention to every detail. Property has accordion shutters throughout, tile in living areas, wood floors upstairs, open kitchen with breakfast area. First floor has a bedroom with private full bath it can be used for office or guest room. Master upstairs with dual sink vanity, jetted tub, separate shower and 2 walk in closets. 2 bed upstairs and 1 full bath. Laundry room upstairs!!! Great community w/ Clubhouse, 2 pools, Playgrounds, Gym & Spa. Come and see it, fall in love and make this your home!!! Directions: From I75 Exit W Miramar, On Dykes/SW160th Ave Turn Right. On SW 28th St Turn Left. You Will See The Entrance To The Community Silver Isles. Make Immediate Right To SW 163rd Ave, Left To SW 57th St Follow The Curved Street Turn Left To SW 29th St.